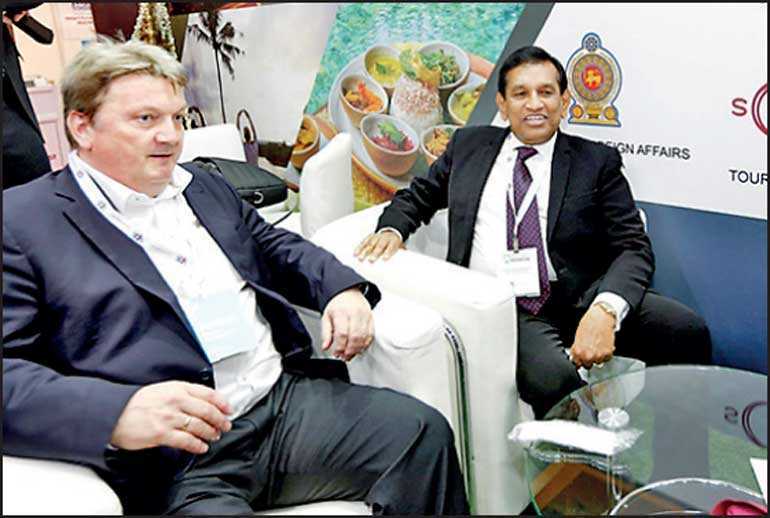 Making wellness tourism a catalyst to boost the thriving tourism industry of the country, six leading companies in the wellness tourism sector from Sri Lanka participated in ‘Arab Health 2019’, which was held in Dubai, UAE from 28 to 31 January 2019 at Dubai World Trade Center, under Sri Lanka’s country pavilion, promoting Sri Lanka as an emerging wellness tourism destination. This was the first time that Sri Lanka participated in this annual event, which is the largest health and wellness exhibition in the Middle East and North Africa region. 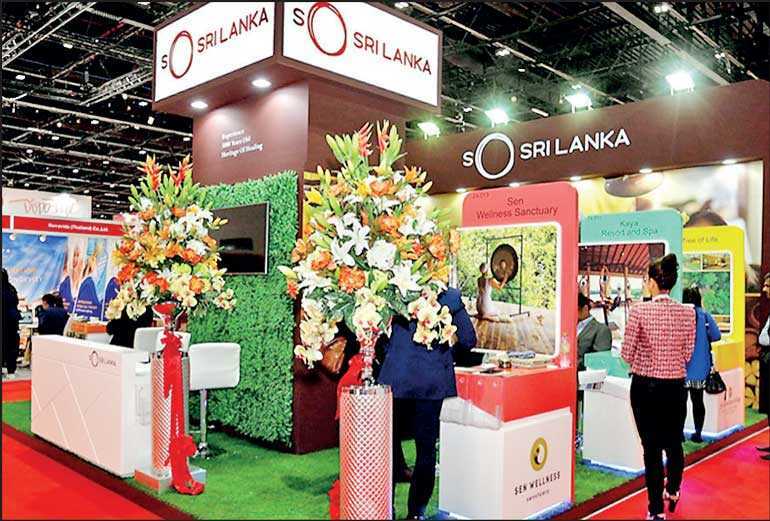 Utilising the main source of funds allocated under the Economic Diplomacy program initiated by the Ministry of Foreign Affairs with the support of Sri Lanka Tourism Promotion Bureau and the Export Development Board, Sri Lanka’s participation at ‘Arab Health 2019’ played a vital role in promoting Sri Lanka’s specific brand of wellness tourism in a forum that attracted a plethora of worldwide brand leaders engaged in healthcare promotion. The Sri Lankan pavilion at the event was inaugurated on 28 January by the Minister of Health, Nutrition and Indigenous Medicine Rajitha Senaratne, with ceremonial cutting of ribbon in the presence of Ahamed L.S. Khan, Charge d’Affaires of the Embassy of Sri Lanka in Abu Dhabi, Charitha Yattogoda, Consul General of Sri Lanka to Dubai and the Northern Emirates, Asiri Wickaramasooriya, Country Manager of the Sri Lankan Airlines in UAE, Jeevana Fernando, Assistant Director of Sri Lanka Tourism Promotion Bureau and Asoka Hettigoda, incumbent member of the Board of Directors of Sri Lanka Tourism Promotion Bureau and the Managing Director of Hettigoda Group, along with the owners/senior representatives of the participating Sri Lankan companies. In addition, Consuls General based in Dubai representing other countries, Riza Muhammed, Chairman of the Sri Lanka Business Council in Dubai and Northern Emirates, journalists, business leaders, entrepreneurs and prominent members of the Sri Lankan expatriate community based in the UAE were also present at the official opening of the Sri Lankan pavilion. The Consulate General of Sri Lanka in Dubai and the Northern Emirates, in the context of facilitating the above event, took steps to organise one to one business meetings with tour operators and travel companies at the Sri Lanka pavilion in establishing business links related to wellness tourism, in addition to apprising of over 1,000 travel related companies operating in UAE and Middle East with regard to Sri Lanka’s first ever participation at Arab Health by inviting them to visit Sri Lanka’s pavilion for networking with the Sri Lankan exhibitors. The Consulate General was also able to provide maximum publicity to the event through UAE based print and social media in addition to collaborating with the Sri Lankan Airlines to launch a publicity campaign through e-flyers. Especially targeting the UAE and Middle East based media along with expatriates and Arab customers, who top the ranks in terms of spending, a special microsite was also launched by Sri Lanka Tourism Promotion Bureau both in English and Arabic languages, consisting of comprehensive information related to wellness tourism in Sri Lanka with the assistance of the Consulate General. The participating companies, which included Hettigoda Industries Ltd., Heritance Ayurveda Maha Gedara, Barberyn Ayurveda Resorts, Vingyana at Reefs (Kaya Health Resort), Sen Wellness Sanctuary and Tree of Life Ltd. were able to capitalise on the numerous opportunities created at the event in order to access the huge wellness market, and thereby make an aggressive push to promote Sri Lanka as an emerging destination for wellness tourism and create the perfect holiday package and a gateway for tourists visiting Sri Lanka. Assuring the extension of all possible assistance to promote wellness tourism through their forum, the Business Council of Sri Lanka in Dubai and Northern Emirates, in association with the Consulate General of Sri Lanka, hosted a dinner for the visiting Sri Lankan companies at a five-star hotel in Dubai with the participation of Board of Directors and large number of members of the Business Council. The Ministry of Foreign Affairs of Sri Lanka took the charge of the overall coordination in relation to Sri Lanka’s participation in the Arab Health 2019 locally under the Economic Diplomacy Programme with the assistance extended by Sri Lanka Tourism Promotion Bureau and the Sri Lanka Export Development Board. The Consulate General of Sri Lanka in Dubai and Northern Emirates facilitated and successfully executed Sri Lanka’s participation in the event in association with event organisers and other relevant stakeholders in the host country, earning accolades from all the participating Sri Lankan companies for the large number of one to one business meetings arranged with leading tour and travel related companies in the host country to establish much needed business links apart from the overall arrangements that were successfully made in relation to Sri Lanka’s first ever participation in the event. This year’s Arab Health 2019 attracted 4,150 companies from over 160 countries, with over 84,500 healthcare and trade professionals visiting the four-day event.